You can order with confidence online using Paypal. Our delivery charges are listed here, please remember to include the top-up rate for delivery outside the UK. Alternatively, please fill in the order form and we shall send an invoice with your order. Prices correct to 30 April 2019. A succinct and user-friendly toolkit to help schools address prejudice, reduce bullying and promote equality holistically. Created with schools for schools, the toolkit is sponsored by NASUWT, the teachers’ union, and has won an Innovative Practice Award 2016 from the Zero Project, for a world with zero barriers. 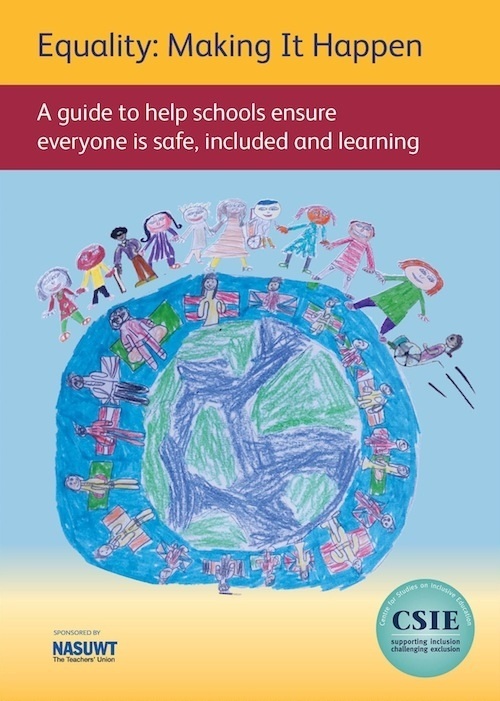 “Equality: Making It Happen” is relevant to children and staff in primary and secondary schools and engages the whole school community, placing pupils at the heart of protecting children’s rights in school. It is made up of user-friendly reference cards which offer: key information, practical advice, suggested activities, examples of good practice, equality audit tools and links to further information and support, including lesson plans. The toolkit includes a CD with all printed materials in electronic format, for easy reference and for adapting to a specific context, as well as additional resources. Materials can be used for teaching and learning activities, assemblies, peer mentoring, school council, staff training, equality policy and whole school development. “Equality: Making It Happen” has received overwhelming praise from teachers, senior leaders and independent reviewers, for example: “an absolutely amazing resource that is easy to use and extremely well designed” and “"this should be on every school's bookshelf". The entire toolkit and selected extracts are also available in PDF format from our TES online shop. This report presents school placement trends (i.e. the proportion of children placed in special schools or other separate settings) from 2007 to 2013 for each local authority in England. It is the most recent issue in the ongoing (since 1988) CSIE series on school placement Trends, the only source of local authority comparative information; the government collects the information but only publishes a national average. Like other Trends reports before it, this reveals huge variation in the way local authorities respond to diversity; some rely more on ordinary local schools, while others regularly send high proportions of children to separate special schools. These differences bear no simple relation to the size of a local authority or its social or geographical characteristics. Such clear and detailed information on what routinely happens in one's own, neighbouring and distant local authorities will be of interest to parents, education professionals and campaigners alike. It can help people reach better informed decisions about individual children's school placements and formulate better informed evaluations of provision at local and national levels. The full report and selected tables are also available in PDF format from our TES online shop. The third edition of the Index for Inclusion, substantially revised and expanded by Tony Booth, is now available. This is a values-based resource for school self-evaluation and improvement. It draws together interventions in education to do with environmental sustainability, global citizenship, community building, health promotion, values, rights and non-violence. 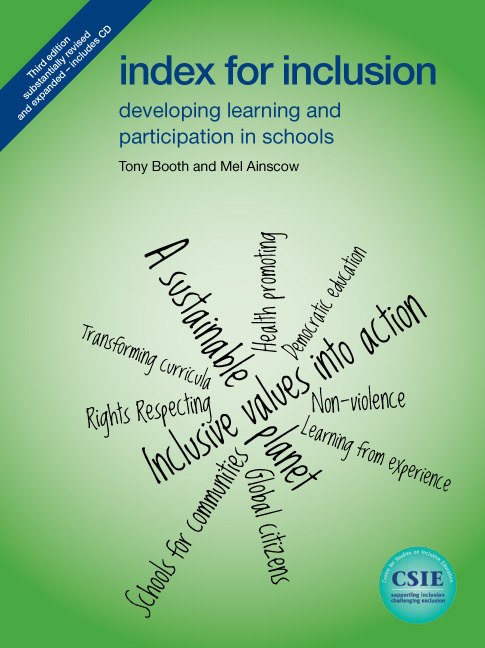 It provides a detailed outline of a new curriculum for schools, which reflects children’s experiences and futures and is relevant to young people’s lives in any part of the world. The Index is an accessible, flexible and practical resource. It encourages the whole school community to work together in reviewing all aspects of cultures, policies and practices in their school. It helps schools to: put their own framework of values into action; carry out a thorough self-evaluation; produce a detailed school improvement plan; minimise barriers to learning and participation; empower adults and children to voice their ideas; and present to governors and inspectors a clear rationale for development. Spiral bound for easier handling, the revised Index comes with a CD which provides an electronic version of the document and includes questionnaires that can be adapted to the context of individual schools. "The discussion on values is the key to inclusion." "Thought provoking, incredibly useful, challenging document." "The Index made us think more clearly about things we had assumed were in place." "Easy to dip into or read all the way through." "It’s your self-evaluation done for you, in a far better way." For queries about the Index for Inclusion please contact info@indexforinclusion.org. The Index for Inclusion Network (www.indexforinclusion.org) is a network set up by Professor Tony Booth, principal Index author. Written for busy school practitioners, this guide clearly outlines current legal duties and provides a practical framework for writing and reviewing your school’s single equality policy. Over and above offering help to complete a paper exercise, the guide invites schools to explore their position on a range of equality issues, articulate their commitment to equality and develop more inclusive provision by actively seeking equality for all, particularly those at risk of discrimination or marginalization. The Welcome Workbook is a practical resource for people working in local authorities who want to see an increase in the number of children fulfilling their right to mainstream education. 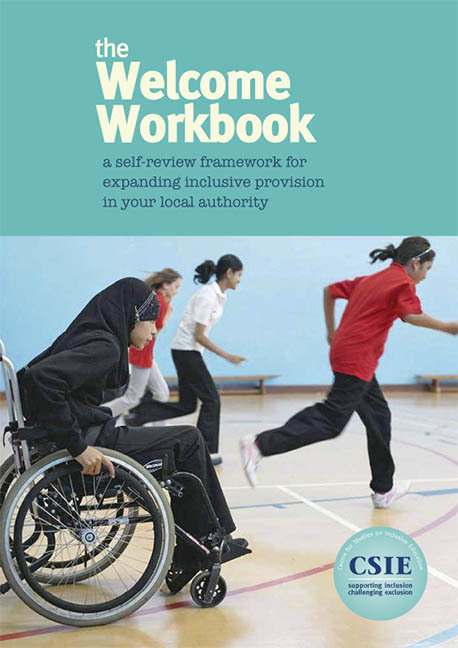 By providing a clear self-review framework, The Welcome Workbook enables local authorities to audit their existing processes and map a route towards more inclusive provision for a greater number of children and young people, with positive benefits for all. This 2006 revised and updated edition of the Index for early years and childcare now includes a CD to make it more accessible. The Index is a detailed set of materials to help settings increase the participation of young children in play and learning. The Index involves a self-review of all aspects of a setting, drawing on additional help as needed. It encourages the involvement in inclusive development of all practitioners, volunteers, management committee/governors, children, young people and their parents/carers. Actions to assist inclusion are prioritised and a development plan is drawn up, implemented and reviewed using the Index materials. These changes are sustained in the setting as the process progresses annually. Price includes FREE 6-page Index for Inclusion insert for early years and childcare. Help us to continue promoting the development of inclusive education. Make a secure donation at Charity Choice.